During one stop in Colombia alone, the ship's staff performed 110 surgeries. camera (Pat Morrissey/Navy) Lt. Cmdr. Matt Stepanovich, from Portsmouth, Va., examines a patient's foot at a land-based medical site in Turbo, Colombia. Medical staff members from a U.S. Navy hospital ship have already seen about 14,500 patients during the first half of the ship's mission to Central and South America to assist Venezuelan refugees who've fled their country because of a devastating economic crisis that's caused shortages of food and medical supplies. The USNS Comfort hospital ship departed Norfolk on Oct. 11 for an 11-week deployment and has since assisted patients in Ecuador, Peru and Colombia. 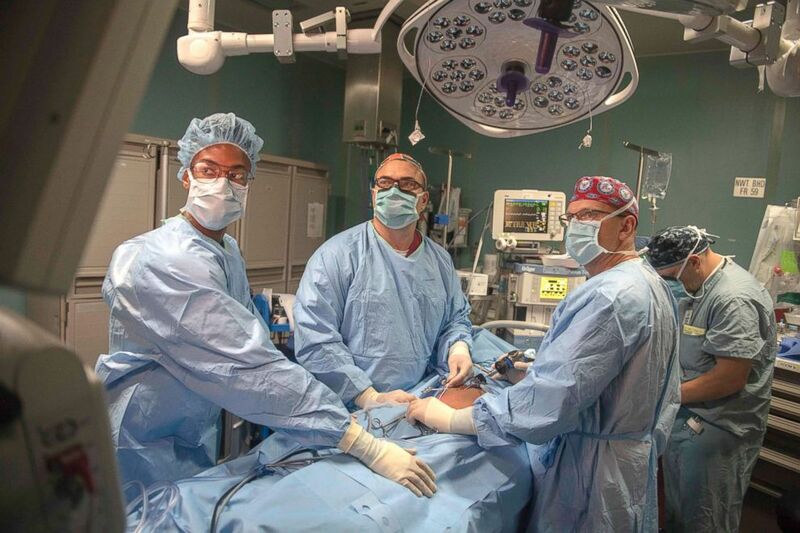 The ship on Tuesday departed Turbo, Colombia, where medical staff have treated 4,280 patients and performed 110 surgeries in the last week, according to U.S. Southern Command. Patients are seen at both land-based medical sites and on board the ship, depending on the patient's needs. (Kris R. Lindstrom/Navy) Medical personnel perform abdominal surgery on a patient to repair a hernia in the operating room aboard the hospital ship USNS Comfort. The United Nations announced earlier this month that the number of refugees and migrants from Venezuela worldwide had reached 3 million. Colombia had the highest number of Venezuelan refugees and migrants with more than 1 million, followed by over 500,000 in Peru and over 220,000 in Ecuador, according to the U.N. The sheer volume of individuals in need can overwhelm local medical services and the communities that try to accommodate them. Meanwhile, in a bitter feud with the U.S., Venezuela President Nicolas Maduro has refused all American aid. The Comfort's surgical and medical services include X-rays, CAT scans, dental services, an optometry and lens laboratory, a physical therapy center and a pharmacy. The ship also maintains up to 5,000 units of blood for medical services. "The ship's coordination with their host governments to identify patients whose needs can be addressed by the crew has gone very well, and the patient flow has been on par with what was estimated by the mission's planners," Jose Ruiz, a spokesperson for U.S. Southern Command, told ABC News on Tuesday. This week, the U.S. Embassy in Bogota tweeted a photo showing a woman who received an inguinal hernia operation aboard the Comfort. "There are needy people, we really don't have possibilities to get the treatments or exams that they have done for us," the woman said, according to the tweet. The Comfort is scheduled to arrive at its second-to-last stop, Riohacha, Colombia, on Friday. (Scott Bigley/Navy) The hospital ship USNS Comfort anchors off the coast of Colombia on an 11-week medical support mission to Central and South America as part of U.S. Southern Command's Enduring Promise initiative. 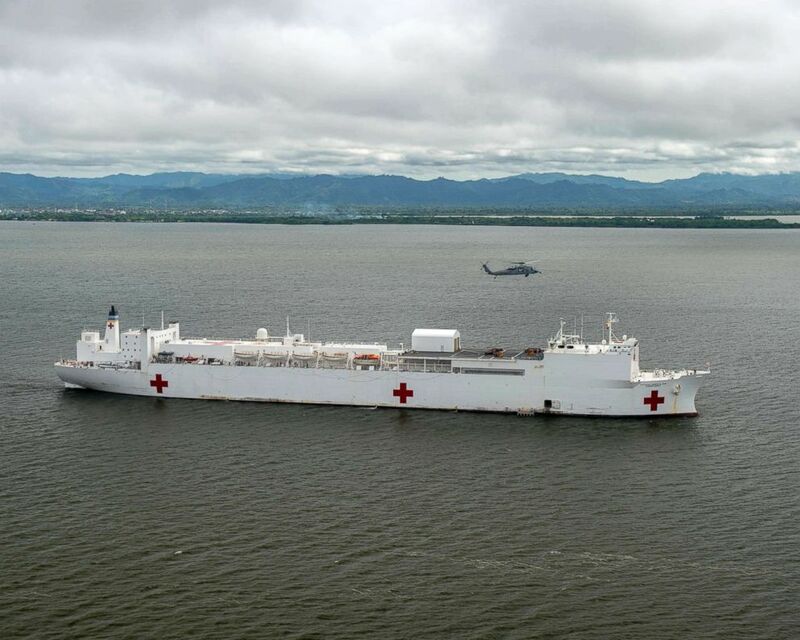 Defense Secretary James Mattis announced that the U.S. would deploy the hospital ship after a visit to Colombia in August in which he met with President Ivan Duque, who requested assistance to relieve stress on his nation's healthcare system. Mattis said at the time the ship was an effort to deal with Maduro's "increasingly isolated regime." The U.S. has provided nearly $97 million for Venezuelan refugees since October of 2016, according to the State Department, but that money is directed to countries accepting the refugees, not to Venezuela itself, where Maduro doesn't allow it. United States Agency for International Development Administrator Mark Green has said the U.S. stands ready to offer humanitarian assistance Venezuela if Maduro would allow access.